To register and login to the tygerbergeisteddfod.co.za webpage. To view the site properly please use FIREFOX or CHROME or BING browsers. The Tygerberg Eisteddfod front page will open. Please NOTE you will be able to browse the site but you cannot create forms, book events, or view the syllabus unless you login as a user to the site. Fill in the form on the Register on Site menu under How to menu items. This will open a form which will show blank fields which you must fill in and submit. An email will be sent to you giving your login and password. Please use this info to login in future and click remember me if you don’t want to login each time. 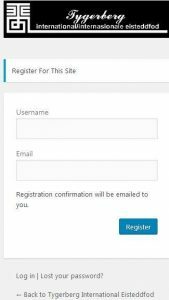 If you are already logged in, you can use this form which will give all your login info in the fields , to change or update your profile and click update. To Login , click the Login button in the menu at the top of the page , A box will open asking you to enter Login and password. The system will send you an email confirming your registration and ask you to click a link back to the site to confirm you are not a robot or spam and set up your password. A new box will appear asking you to enter tour password. NOTE the system will try to generate a strong password for you , If you use a your own password, please use a combination of Upper and lower case letters and numbers like YourName?1122334455, write it down. If the system wont accept your password then it is NOT a STRONG password and you need to create one. Once this has been entered you can login by pressing login. 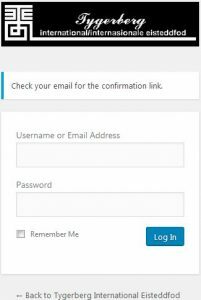 This will return you to the login page, Enter your User Name or e mail address and password , click the remember me box and Log in. The site will remember you login details and allow you to enter each time with no more Logins. It now know who you are,!!!! It should say HI “your name” at the top right hand corner. If you ever lose your password or can’t remember it then click “Lost your password “ on the login screen and create a new one. It looks long winded but its quite simple once you know how to register and is the standard now used worldwide to enter protected sites. It only has to be done once and is there to protect your information and protect the site from spammers. You can now use your login and password to get any PC or cell phone to login to the site with your details.